Have you ever wanted to have Google Calendar there with you without opening a new browser window or checking your phone? Well, there is an extension for that! It’s an official extension called Google Calendar by Google. Click here to get it! When you install the extension you will have to authorize it with your Google account, so make sure you’re logged into your Google Apps (or even better, the browser itself) with your work Google account. When it’s installed, it will sit on your upper right of Google Chrome with a “timer” that counts down to your next scheduled appointment. If you have multiple calendars you can select which ones it displays. 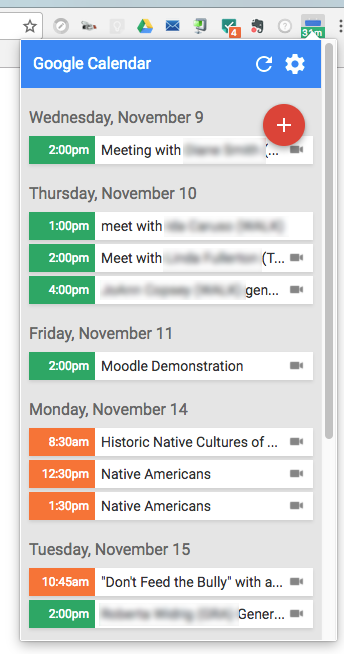 When you click the extension it populates a list of all your events as shown here.